Many rural African communities live either in or around protected areas. Rural communities also wish to draw on the influx of tourists to their region and have endeavored through small businesses to services clients. There are many challenges for communities to compete in an already existing tourism market, none the less they do. 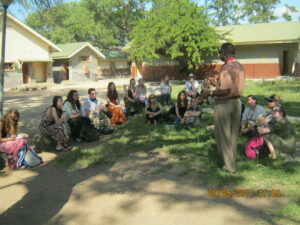 This class explain the current situation and includes an excursion to the neighboring community-based tourism initiatives, as well as a high-end lodge operation, to compare similarities and differences. We further examine the opportunities for collaboration and partnerships between emerging community-based tourism initiatives with established corporate, or, large tourism enterprises. This class is approximately +-1,5 hours in duration and given by Mr. Ashwell Glasson, Ms. Jenny Newanum. It includes a 2-3 hour excursion to nearby rural tourism initiatives.